H.E. Vishnu Prakash, Indian Ambassador to Korea, will present a lecture entitled ‘India’s Ties with South Korea and East Asia: Present and Future’ at Asia Society Korea Center’s Monthly Luncheon Series. 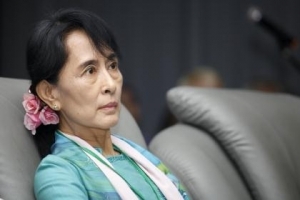 The Opposition leader of Myanmar and Member of Parliament, Aung San Suu Kyi, arrived on Tuesday on her first visit to India since she was released from nearly 15 years under house arrest.Suu Kyi left for New Delhi on Monday via Bangkok on her visit to India. India’s defense budget has shown a substantial increase in the past five years, according to defense experts and analysts. Following the recent budget announcement by the Defense Minister A. K. Anthony, for the fiscal year 2012, the focus returns to India’s growing defense spending. Scheduled to take place in Seoul from March 26 to 27, 2012, the “2012 Seoul Nuclear Security Summit” will discuss issues such as cooperative measures to combat the threat of nuclear terrorism; protection of nuclear materials and related facilities; and prevention of illicit trafficking of nuclear materials. It’s the season for birthday bashes in North Korea. North Koreans showered superlatives of praise for the late “Dear Leader” Kim Jong-il on what would have been his 70th birthday on February 16 had he survived the heart attack that killed him two months earlier. The Universal Peace Federation (UPF) is an NGO in Special Consultative Status with the Economic and Social Council of the United Nations. Agriculture has been the traditional occupation in rural China for centuries, but rapid economic growth in China has prompted millions of people to move from rural green areas to ‘concrete jungles’ – the cities where employment is more lucrative. Although the Hukou system is in place, in which individuals are registered according their birthplace and under residency permit to live there, it is believed to be less disturbed by officials as more cities are allowing farmers for both temporary and permanent work. The U.S.-Korea Free Trade Agreement (KORUS FTA) will likely finally be ratified in the near future, despite various pending obstacles such as the disagreements with the opposition parties over aspects of the FTA such as the controversial (InvestorState Disment) article. However, the long-stalled FTA deal is expected to generate considerable mutual benefits after its ratification. Upon winning a final approval from the U.S.
Japan’s new prime minister, Yoshihiko Noda, has taken over a regime that, although divided and weakened by disaster at the Fukushima nuclear power plant in March, has not been inclined to pervasive change. The Thousand Islands regency under the Jakarta Provincial Government has been a major tourist destination for the region, attracting anywhere between 15,000 to 20,000 local and international tourists every day. The group of islands is divided into the northern and the southern parts, but only the southern area currently enjoys electricity supplied via underwater cables. Mexico’s environmental policy has been undergoing some significant changes at the behest of President Calderon, all intended to put the focus of the country’s environmental development on sustainable, or green, energy production.